Sunday 27 April 2003: Manchester United are leading Tottenham 2-0 at White Hart Lane. Knowing a win will put their side five points clear at the top of the table, the jubilant away support chant “we want our trophy back” throughout the latter stages of the second half. It’s almost a year to the day since the Premier League title – United’s for all but three seasons of the first decade of its existence – was surrendered to Arsenal at Old Trafford, a game Gunners fans still mark to this day with a vivid gold banner at the Emirates Stadium. The Red Devils were on their way to toppling a truly formidable side, one which appeared to be on the verge of establishing a new period of domestic dominance. 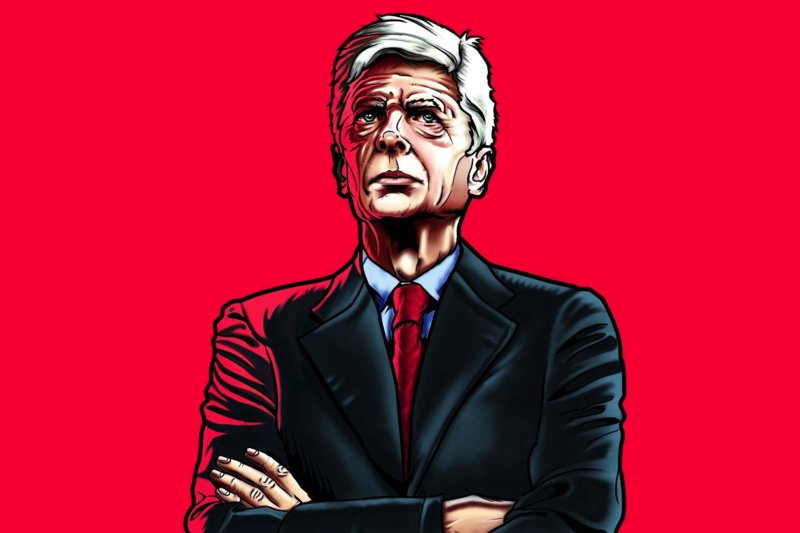 The pinnacle of Arsène Wenger’s reign at Arsenal is often seen by neutrals as the Invincibles season of 2003/04, or even the double winners of six years earlier. But it’s arguable that the Frenchman’s finest vintage was 2001/02. Wenger’s second league and cup-winning team had it all: the swaggering pomp of Thierry Henry, Sylvain Wiltord, Freddie Ljungberg and Robert Pires; the precise brilliance of Dennis Bergkamp; the languid presence of Patrick Vieira; and the defensive solidity of Sol Campbell and Ashley Cole. Stalwarts like David Seaman, Lee Dixon, Martin Keown, Tony Adams and Ray Parlour provided further grit, steel and experience both on and off the pitch. Two years before they claimed that unique golden trophy, they became the only team in English top-flight history to score in every league game. Just as impressively, they also remained unbeaten away from Highbury and embarked on a run of 13 consecutive wins at the end of the season, a record only topped 15 years later by Pep Guardiola’s Manchester City. It’s no wonder the travelling United support were so happy on that spring afternoon in north London. After pushing Sir Alex Ferguson’s treble winners all the way in both league and cup, the Gunners struggled to keep up with their northern rivals, finishing 18 and 10 points behind the champions in each of the following two campaigns. Ahead of the 2001/02 season, Wenger knew he needed a strong transfer window. After signing Ruud van Nistelrooy and Juan Sebastián Verón, the latter for a British record fee, it seemed the Red Devils were going to be harder to beat than ever. The headline signing at Highbury was a free transfer. Sol Campbell was brought in from arch-rivals Tottenham in one of the most controversial moves in British football history to bolster an ageing backline which had been forced to call upon Oleh Luzhny and Igors Stepanovs for much of the previous campaign. He was an instant success. Francis Jeffers, Everton’s young striking prodigy, was snapped up for £10m, while Giovanni van Bronckhorst, then a midfielder, came in from Rangers to try and fill the sizeable gap which had been left by World Cup winner Emmanuel Petit the previous summer. Richard Wright was also purchased for £6m from Ipswich to provide competition for David Seaman. The Gunners got off to a mixed start, with Wenger’s new recruits taking time to gel. A disappointing 2-1 home defeat to nine-man Leeds was sandwiched between crushing 4-0 wins over Middlesbrough and Leicester. 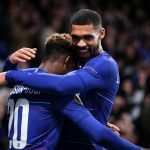 There followed an end-to-end 1-1 draw at Chelsea, before the Gunners started to truly turn on the counter-attacking style, easing past Fulham, Derby and Southampton to record three consecutive away wins. Despite poor form on the road in Europe, Henry, Pires and Ljungberg had defences running scared and crowds purring across the country. Highbury was a grandiose old ground. Its marble and art deco features may have appealed to fans of architecture, but it was rarely intimidating for visiting teams, which worked in Charlton’s favour when they made the trip to Islington in November 2001. Alan Curbishley’s men found themselves 4-1 up early in the second half, helped along by a Wright own goal, the former Ipswich man having come into the team to replace the injured Seaman. 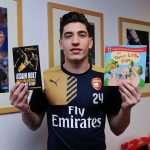 Despite having 27 shots, the Gunners had the same old defensive issues to blame for the eventual 4-2 defeat, which left them fifth in the table. A week on, an injury-time Gus Poyet equaliser in the derby made it four games without a win. Next up was a first showdown of the season with great rivals United. The champions were struggling. Ferguson’s premature decision to announce his retirement, coupled with the departure of Jaap Stam, had resulted in an uncharacteristically slow start. It was the perfect time for Arsenal to turn their season around and show their rivals they meant business. 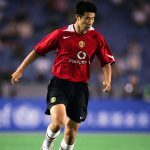 United took an early lead through Paul Scholes, but two horrendous errors from Fabien Barthez to let in Henry, as well as an impudent Ljungberg chip, gave the home side all three points and reignited their title hopes. Wins over Aston Villa and Ipswich followed, before an Alan Shearer-inspired Newcastle beat Arsenal at Highbury to leapfrog the Gunners into top spot. It would be their final defeat of the league season. At Anfield, two days before Christmas, Van Bronckhorst was sent off after just 35 minutes for diving to make a tough test – Arsenal hadn’t scored away at Liverpool in their last five visits – even harder. But Henry tucked away a penalty after Jerzy Dudek felled Ljungberg and a bursting run from Pires allowed the Swede to tap home in the second half. Despite Jari Litmanen’s consolation, Wenger had the statement victory he’d craved, one which represented some of the very best qualities of his side: determination, skill, resilience and a knack of always being able to find the net. 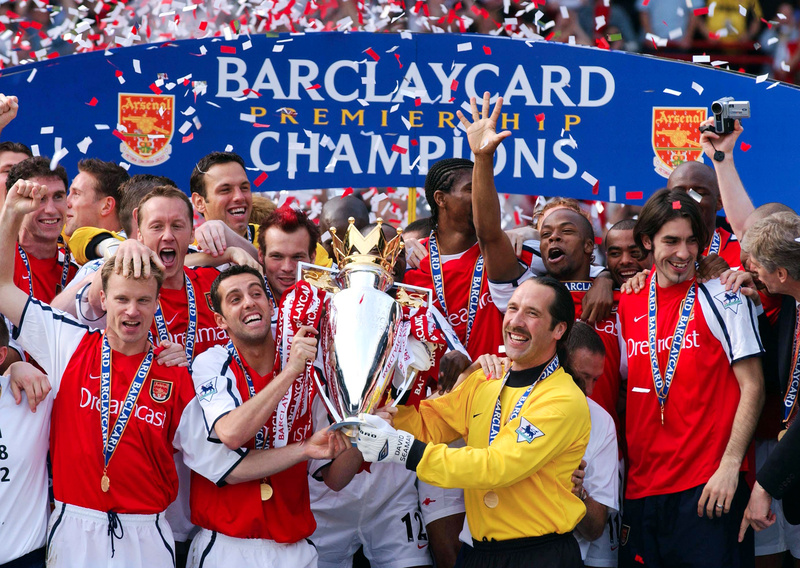 Two Highbury victories over Chelsea and Middlesbrough – both from behind – further emphasised that point, meaning the Gunners went into 2002 top of the pile and well-placed to claim a 12th league title. This, though, was one of the most competitive seasons we’ve seen since the Premier League came into being in 1992. Aston Villa, Leeds, Newcastle and Liverpool all led at various points, but it was United – in the midst of a run of 12 wins in 13 games – who ominously took charge in the early months of the new year after Arsenal drew three of their next five, against Leeds, Liverpool and Southampton. Jo Tessem struck a late equaliser to silence the crowd – save for the legendary Highbury screamer – and leave the Gunners in fourth, albeit with a game in hand on both Liverpool and United. One of the most thrilling and relentless title races in English football history was about to begin. Meanwhile, the previous season’s runners-up were strolling through the early rounds of the FA Cup. A full-strength side, including Henry, Ljungberg, Vieira and Pires easily dispatched Watford at Vicarage Road, before a modicum of revenge for defeat at the Millennium the previous May was gained as Bergkamp’s first-half goal knocked out Liverpool at Highbury. 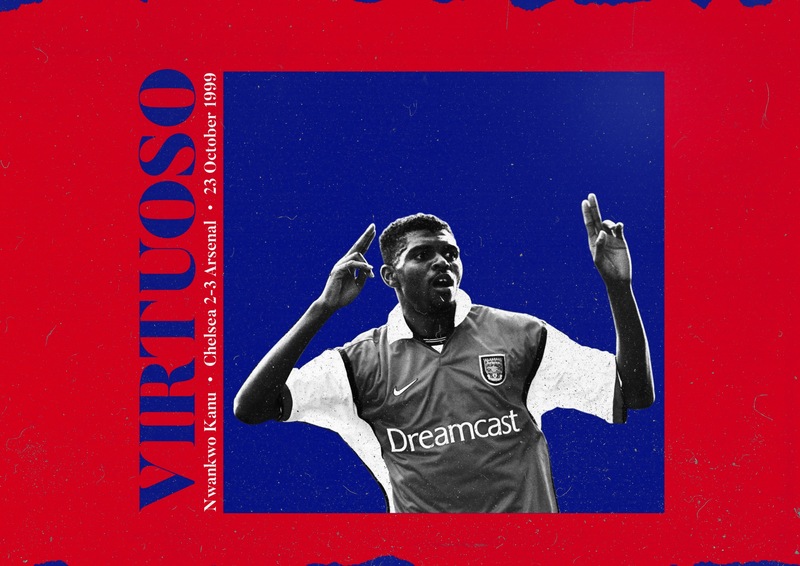 A 5-2 win over lower-league Gillingham at the same ground, thanks to efforts from Nwankwo Kanu, Wiltord, Parlour and Adams, secured a quarter-final berth and gave the Gunners added confidence ahead of tough-looking league fixtures at Everton and Newcastle. The Toffees had been the hapless opponents on the day Arsenal clinched their first Premier League title, but this time around they provided a sterner test. Wiltord scored the only goal of the game at Goodison Park as the visitors embarked on their now legendary winning run. Victory at St James Park followed, with Bergkamp famously tying Nikos Dabizas in knots to put paid to Bobby Robson’s title ambitions. Maximum points were also achieved against Derby, Aston Villa and Sunderland, but Arsenal were still third going into April. Worse still, Pires – the division’s standout player and the man who had helped see off Villa with a delightful chip over Peter Schmeichel – had been ruled out for the rest of the season after being injured in the quarter-final FA Cup win against Newcastle. In January, Danny Murphy had scored the winner at Old Trafford for the second season in a row. It was United’s seventh defeat of the season, and Liverpool’s first victory in six. From then on, both sides were ruthless, pushing the Gunners all the way. Van Nistelrooy, scorer in a then-record eight consecutive games in December and January, continued to find the net, while the partnership of Michael Owen and Emile Heskey was blossoming at Anfield. Loan signing Nicolas Anelka, formerly of Arsenal, also weighed in with some important goals, none more so than a late equaliser in the Merseyside derby; the only points the Reds dropped in a storming 12-game unbeaten run. Who would be next to blink? The answer was Gérard Houllier’s Liverpool. After Arsenal had squeaked past West Ham thanks to late Ljungberg and Kanu strikes in their game in hand, Spurs did their neighbours a huge favour, beating the Reds 1-0 at White Hart Lane. Arsenal then won at Bolton – a ground which would, in later years, prove their undoing – to put Liverpool out of the race. All eyes now turned to Old Trafford. 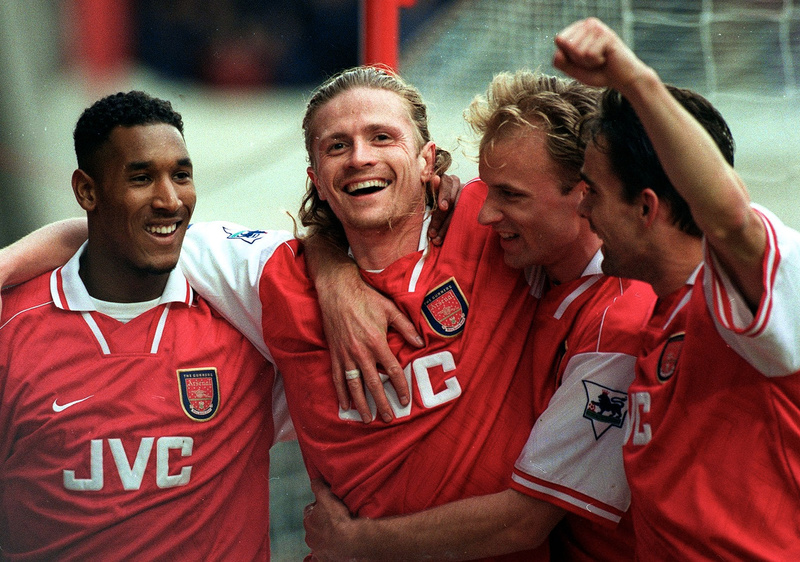 Arsenal had won there in 1998, Marc Overmars’ solo goal swinging the pendulum the Gunners’ way in the title race. This time around, Arsenal only needed a draw – it was United who required all three points to give themselves any hope of claiming the title. At the weekend, goals from Ljungberg and Parlour. the second a dipping, speculative effort from 25 yards out. had seen off Chelsea in the FA Cup final in Cardiff. Ferguson sprung a surprise with his team announcement: 23-goal striker Van Nistelrooy – leading Henry, who was also missing, by one in the scoring charts – was left on the bench, with Ole Gunnar Solskjaer and January signing Diego Forlán leading the line. The first half was frantic, United penning Arsenal in their own half. The home side physically dominated the Gunners but couldn’t test Seaman. 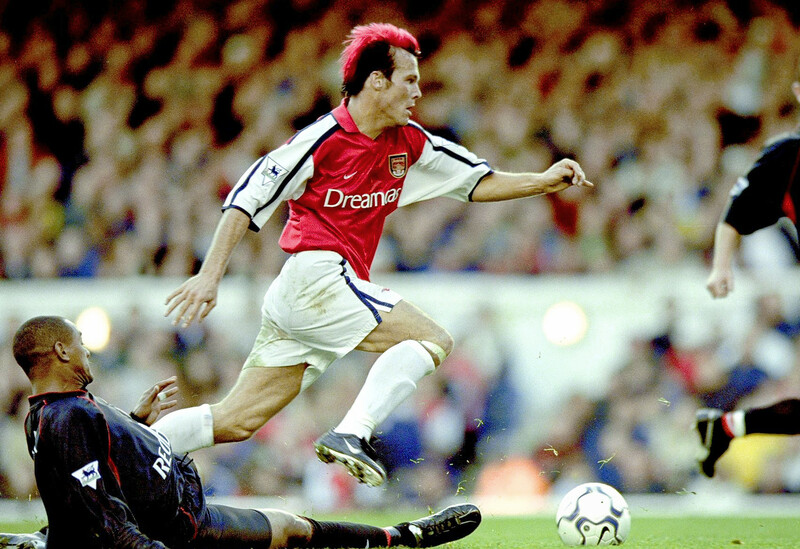 Two early chances in the second half, from Edu and Wiltord, emphasised how threatening the Gunners could be on the counter-attack, but United failed to take heed of the warning. On 55 minutes, Mikaël Silvestre ceded possession to Ljungberg. The Swede, who had a knack of scoring against United, forced Barthez into a save, but Wiltord pounced on the rebound to make the gold-shirted marauders champions and secure Wenger’s second domestic double in four years. A topsy-turvy 4-3 win over Everton put the seal on an exhilarating campaign and ensured Arsenal finished seven clear of Liverpool and ten above United. After drawing with Southampton on 2 February, they had won 13 consecutive league games, smashing Spurs’ record of 11 set in the 1960s. The win at Old Trafford also completed a season unbeaten on the road, a feat then unmatched in English top-flight football. Despite United having statistically the league’s best attack, Arsenal found the net in every single one of their 38 games. In the Invincibles season, dogged by the weight of their impending achievement, they stuttered to four goalless draws. Perhaps it’s understandable why the brilliance of this Arsenal crop has been superseded in the collective mind. But at the time, it seemed as if they’d never fail to win again. No matter what Manchester United, Liverpool, Newcastle Leeds threw at them, they’d inevitably come up with an answer. And Arsenal were so good that if the league’s top scorer Henry didn’t get you, one of Pires, Wiltord, Ljungberg, Kanu or Bergkamp would.